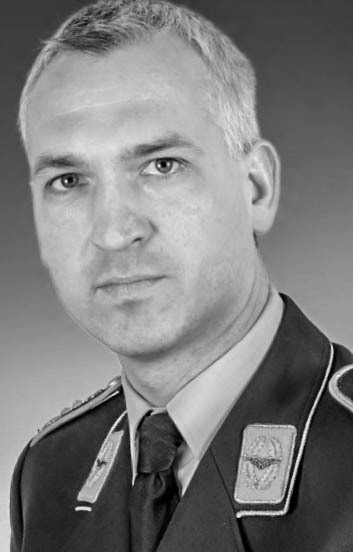 As a member of the military services of the German Air Force since 1990, Andreas Werner studied human medicine at the University of Regensburg and the Heinrich-Heine-University in Düsseldorf (1992 – 1998). He became a general practitioner and a flight surgeon and underwent some international missions in Afghanistan and Africa. In 2007, he was sent to the Charité Berlin, Institute for Physiology and completed his education as a specialist in physiology in 2011. Under initiative and supervision of Prof. Gunga, he brought Thermolab on International Space Station in 2009. Today, he is working for the Center of Aerospace Medicine, German Air Force, at the Flight Physiology Training Center (Königsbrück, Saxony) as a flight physiologist and specialist for high altitude and acceleration medicine. He also contributes to different running projects as a visiting scientist at the Center for Space Medicine Berlin. Gunga HC, Werner A, Sattler F, Koch J. Thermal Monitoring Systems. In: RTO technical report HFM-132 Real-Time Physiological and Psycho-Physiological Status Monitoring Chapter 3, 2008. Gunga HC, Werner A, Stahn A, Steinach M, Schlabs T, Koralewski HE, Kunz D, Belavý DL, Felsenberg D, Sattler F, Koch J. The Double Sensor – A non-invasive device to continuously monitor core temperature in humans on earth and in space. J Resp Neurol Physiol, 2009; 169S: S63-S68. Werner A, Gunga HC. Wärmehaushalt und Temperaturregulation des Menschen in extremen Umwelten und Physiologie und Pathophysiologie des Individuums. Jahrbuch der Österreichischen Gesellschaft für Alpin- und Höhenmedizin, 2009; 259-276. Gunga H-C, Steinach A, Kirsch K, Werner A. Space medicine and biology. In: Ley W, Wittmann K, Hallmann W. Handbook of space technology. Wiley & Sons Publishers, 606-621, 2009. Jumah M, Schlachta M, Hoelzl M, Werner A, Sedlmaier B. Measuring the function of pressure regulating ear plugs in a pressure chamber. Aviat Space Environ Med. 2010; 81(6): 560-5. Werner A, Naschold U, Wilke T, Gunga HC. Sauerstoffversorgung in operationellen Höhen bei Fallschirmspringern : Studie zum Monitoring physiologischer Parameter in der realen Umwelt. Wehrmedizinische Monatsschrift : Organ des Sanitätsdienstes der Bundeswehr ; Mitteilungen der Deutschen Gesellschaft für Wehrmedizin und Wehrpharmazie e.V. / Hrsg. in ZusArb. mit dem Bundesministerium der Verteidigung. 2013; 57, H. 10, 247 – 253. Iblher P, Paarmann H, Stuckert K, Werner A, Klotz FK, Eichler W. Interstitial fluid shifts in simulated long-haul flights monitored by a miniature ultrasound device. Aviat Space Environ Med. 2013; 84 (5): 486-90. Paal P, Strapazzon G, Braun P, Ellmauer PP, Schroeder DC, Sumann G, Werner A, Wenzel V, Falk M, Brugger H. Factors affecting survival from avalanche burial – a randomised prospective porcine pilot study. Resuscitation. 2013; 84(2): 239-43. Opatz O, Trippel T, Lochner A, Werner A, Stahn A, Steinach M, Lenk J, Kuppe H, Gunga HC. Temporal and spatial dispersion of human body temperature during deep hypothermia. Br J Anaesth, 2013, 111: 768-75. Altrichter S, Salow J, Ardelean E, Church MK, Werner A, Maurer M. Development of a standardized pulse-controlled ergometry test for diagnosing and investigating cholinergic urticarial. J Dermatol Sci, 2014; 75(2): 88-93.